The community of MacKillop Catholic College was established on the life and values of Mary MacKillop. From our College Houses and Josephite spirit to living by Mary MacKillop’s famous motto of “Never see a need without doing something about it”, we aim every day to be the best people we can be. Mary MacKillop was born on January 15, 1842 in Melbourne. Her parents, Alexander and Flora, were Scottish migrants. Mary was the eldest of eight children. At the age of 15 she became a governess. Later she worked for stationers, Sands and Kenny. The money earned helped to support her family. It was here in Penola that Mary met Father Julian Tenison Woods, the Parish Priest of the vast Penola and Mt. Gambier district. They talked together about the needs of the children, especially the lack of education. Mary also shared with Father Woods her great desire to become a Religious Sister. In 1865, Father Woods asked Mary if she would take over the school at Penola. Mary was assisted by her two sisters, Annie and Lexie. On the 19th March, 1866, Mary put aside her fashionable clothes and chose to wear black as a sign that she was living the life of a Sister. The rule she followed was written by Father Woods and approved by Bishop Shiel. The following year Mary went to Adelaide where other girls joined her and the Sisters of St. Joseph was established. The Sisters set up schools in remote areas, as well as in the cities, living together in twos and threes in a rented cottage or a room attached to a church. The Sisters’ work was not confined to education: Mary encouraged them to help all in need, especially the poor, the sick and the homeless. Requests came from all over Australia and New Zealand for the Sisters to open schools and Mary, before she died, was to witness the establishment of her congregation in nearly all States of Australia and in New Zealand. She died on the 8th August, 1909. Much of what we are trying to do at MacKillop is related to the development in our community of the spirit of Mary MacKillop. Hers was the uniquely Australian spirituality of a lay woman whose tremendous faith gave her a clear vision of how to minister to the needs of Australians in those difficult days of settlement. Her single-mindedness in making education available for poor children, rather than the relatively better off town and country children, brought her, at times, into conflict with the institutional Church. She wanted to see her sisters ‘up country’, in twos and threes serving small communities and living in solidarity with them. In this sense, the Josephites took the Church to where the people were. There is a real challenge for the students at MacKillop College where the name and works of Mary MacKillop are honoured. In our curriculum and in our awareness of the needs of the community in which we live, we must try to carry on in the spirit of Mary MacKillop. 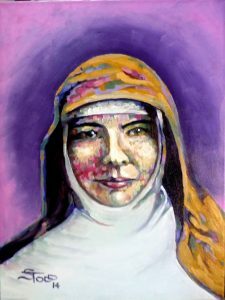 August 8th is the feast day of Mary MacKillop and her spirit within the school community will be celebrated on this day.